More than $80 million from the $3 billion Provincial Growth Fund will boost rural broadband, expand a driver-training centre near Fielding, and look into building a new freight hub near Palmerston North. Regional Economic Development Minister Shane Jones was in the Manawatū-Whanganui today to announce a number of new initiatives, most of which are for Manawatū-Whanganui region. About half of the funding – $40m – will be used for a new regional freight hub near Palmerston North, a key staging point for domestic, imported and exported freight in the Lower North Island. The projects are subject to funding contracts that will include a range of agreed commercial arrangements, targets, milestones and deliverables. Tax cuts or debt reduction? Today’s Herald editorial makes the case that Govt should use extra to cut debt, not taxes. The Prime Minister, an endlessly agreeable politician, entertains talk of tax cuts whenever the Budget surplus turns out to be higher than expected. It is well past time that he stopped doing so and instead made the public better acquainted with its debt position. John Key and his Government know very well that the reason they have managed to bring the economy through a recession and earthquakes in good shape owes just about everything to the very low debt left by the previous Government. We have to hope the next economic “shock” does not happen before 2020, for it is not until then that National plans to have the debt back down to the level at which Labour left it. Really? Government debt has risen from $10 billion in 2008 when National took office to $50 billion now. I don’t think there is any way our economy would allow for an average of $10b per year debt reduction for the next four years. However reducing debt should now be a priority. But the Government still needs to spend, and they should seriously consider reversing the creeping personal tax increases we have had over the last eight years. The calls for tax cuts today are not coming from opposition parties, nor from business lobbies who have seen how low public debt helped the economy weather the global financial crisis better than most others. Business lobbies may well be happy that personal income tax increases while their rates remain static. The Government should not base their tax decisions on who calls the loudest, they should do what is fair. And allowing personal tax rates to creep up is hardly fair on wage earners. There is always pressure to spend more on things like health, social housing, education, crime – and some spending increases are unavoidable, like providing more prison beds. But restoring personal tax parity should also be a serious consideration. We can have both tax cuts and debt reduction from a fair and prudent Government. Parliament is in recess so it’s not surprising that Opposition parties and lobby groups are busy blasting the Government for not spending enough money on all sorts of things. Hospital doctors are threatening to strike over their work conditions. They often work very long hours and a lot of days without a break. Exhausted doctors mustn’t be conducive to the best possible care. The only way of dealing with this is employing more doctors, which will cost more money. More drugs and better healthcare are always on the ‘must do’ list. The notice of strike action issued by the junior doctors today is the result of years of National’s cuts to the health system, says Labour’s Associate Health spokesperson Dr David Clark. Kids in poverty is getting a lot of attention. The ‘Government hates children’ brigade has been vocal again – John Key didn’t help when he compared counting kids in poverty to counting pests. Labour has actually announced a policy, sort of – they would give ‘most’ new born kids $60 a week. At about 60,000 births a year that’s $150-200 million a year. If they kept giving that to all kids until they left school it would add up to over $3 billion a year. I can’t find anything on Labour’s website on this. It may be policy by press, trying to jump on the bandwagon of the day. New Zealand should be taking more than three times the number of refugees, Amnesty NZ says. That costs money. And gets criticised. Demands continue for more action – and spending – on emergency housing and state housing and housing for poor people. And to upgrade housing – we can’t have kids in cold damp houses. Heaters and dehumidifiers and windows all cost money. Trains and tracks and tunnels and bridges. Scrapping fossil fuels. Cycle ways. I’ve just seen “opposition parties calling for more ambitious government targets on climate change’. These all cost money. The National Government needs to live up to its commitments and allocate 0.7 per cent of Gross National Income on development assistance, says Labour’s spokesperson on Pacific Climate Change Su’a William Sio. More aid = more Government spending. Opposition parties are also calling for free tertiary education, cleaning up rivers, the list goes on and always will go on, like the Opposition parties. Is the Government heartless? Do they hate the poor and children and anyone who they aren’t giving more money to? That’s what some people actually say. Minister Anne Tolley said the new scheme would give offenders and their families a chance to lead successful lives and steer them away from a return to crime. Jobs and more money for poor families, reduced crime and reduced prison costs sounds like a positive aim, bu the Opposition will either say it’s not enough or will ignore it in their quest for highlighting negative news. Asking for the Government to spend more money is fine, that’s a part of the Opposition job. But condemning the Government as uncaring kid haters is a bit pathetic and is hardly likely to lead to any improvements. Opposition parties and lobby groups seem to be more intent of grabbing headlines through shock and horror – but they have to compete, ironically, with rich celebrity crap. Governments must always strive to better for it’s people. In the main they do try hard to please most of the people most of the time. Over the top attacks are easier to ignore than well thought through well argued campaigns. PartisanZ posted a comment yesterday about New Zealand’s “giant transport money-go-round” regarding transport funding and spending. This is worth more exposure here. In the Winter 2016 edition of ‘AA Directions’ magazine there’s an excellent article “Taxing Truths” by Peter King about “the giant transport money-go-round”, with additional information & stats by Mark Stockdale. While “the numbers are enormous”, as they say – $10bn allocated from vehicle taxes + $3.9bn from rates revenue June 2015 – June 2018 – an MoT survey shows “79% of trip choices and travelling time is either driving or riding in a motor vehicle.” Walking comprises 17%, public transport 2.8% and cycling 1.2%. Our spend-up is not extravagant by international standards. Of 48 nations in the international transport forum, NZ’s spend as a proportion of our economy is 46th. The stats regarding funding sources are fascinating to me. Public Transport Users = $320m, Tax Payers $460m, Rate Payers $1.6bn and Motorists $3bn. Of the Motorists contribution, Rego = $183m, while Petrol Tax – which makes up $1.00 of a litre of petrol costing $2.00 – total = $1.6bn. Around 65% of this goes to the National Land Transport Fund. So public transport’s spend clearly outweighs its preferred usage, although perhaps it must be offset by whatever reductions are achieved in fuel consumption, congestion and pollution? Major changes coming in the transport realm though. Fuel tax has apparently been rising partly (or mostly?) as a result of increased fuel economy? As vehicles become electric and to a lesser extent hybrid this form of funding – and tax increase – will be impossible to justify. I am interested that the authors have picked a win with the statement that the future is electric. I would have thought hydrogen power cars might be a significant contender.. The amount of tax on a litre of petrol is truly eye watering and is incredibly regressive have a disproportionate impact on the poor segments of society. Yes, both hydrogen powered – with the hydrogen produced elsewhere – and perhaps water-powered, where water is converted to HHO or “Brown’s Gas” onboard? [I know almost nothing about the chemistry or technology – I’m not that way inclined]. Other more sustainable options should be competing with electricity in a so-called ‘free market’, although both access to water and electricity production surely have their environmental and geopolitical implications too? Years ago I read a tiny news item in the Herald or Star about a Kiwi man arrested at Auckland airport trying to leave the country carrying trade secrets. He apparently worked for a company which produced and sold welding equipment based on Brown’s Gas – or similar – where the one set of equipment could do all forms of welding? [My remembered details are sketchy]. The same technology could apparently be applied to an internal combustion engine with very few modifications? My understanding is that they are just very efficient electrolysers. Instead of using a constant DC power source, like we did at school, they use electronics to deliver pulsed DC at just the right frequency. As for powering a car with one, well you would need a big battery that you would still have to charge from an outside source. While the Government tries to justify underfunding by saying there’s been a global financial crisis and everyone has to tighten their belts, the fact is that Government has chosen to spend billions of dollars on other things, such as tax cuts for the wealthiest, roads of ‘National’ significance etc. It’s not that there isn’t enough money. It’s that this government chooses to spend it on other things. An important role in Opposition is to question and challenge spending priorities, especially on things like health. We will always have a problem with not having enough money to spend on health care and hospitals. Getting the best value from available funds is a difficult balancing act. And getting the best balance out of the country’s overall budget is also very difficult and will always be open to disagreement. Health is a particularly sensitive issue because it can affect us so much. What care is available can be the difference between life and death, for our parents, our children, and ourselves. I’ve seen some very good aspects to our health care, which is the best it has ever been in New Zealand and comparable to some of the best in the world. I’ve also experienced and seen some of the frustrations, deficiencies and personal costs. But when our health and our lives are at stake we will always want better and more. Hague mentions tax cuts for the wealthiest and roads of ‘National’ significance. I need to travel by road to get to the doctor or the hospital. “Tax cuts for the wealthiest” was actually tax cuts for many of us. It may have made health insurance more affordable for some. That the better off can afford premium health cover and can afford to pay for private tests, treatment and operations creates a two tier health system which to some will appear to be unfair – life can be unfair, ask anyone who gets cancer – but it has wider benefits for al of us – if more people can afford their own private health care then it eases the pressure on public health provision for those that rely on that. Should we proportionally increase health spending? Is it more important than roads? How many people get heart attacks from Auckland traffic induced stress and poor lifestyle (like eating/drinking junk on the road)? Is it more important than big city rail links? Is it more important than feeding all kids at school? Is it more important than subsidising the Christchurch rebuild? Is it more important than free tertiary education that will increase the number of futile degrees and diplomas? Is it more important than increasing minimum wages? Is it more important than bloated political PR departments? Is it more important than Citizen Initiated Referenda used by parties for political purposes? I have no argument with Hague continually raising the issue of health spending priorities, even though he is a bit selective and catch-phrasy with his comparisons. But we will always have arguments over what is the most deserving recipient of our tax dollars. Especially when our lives may depend on it. More spending for better health? 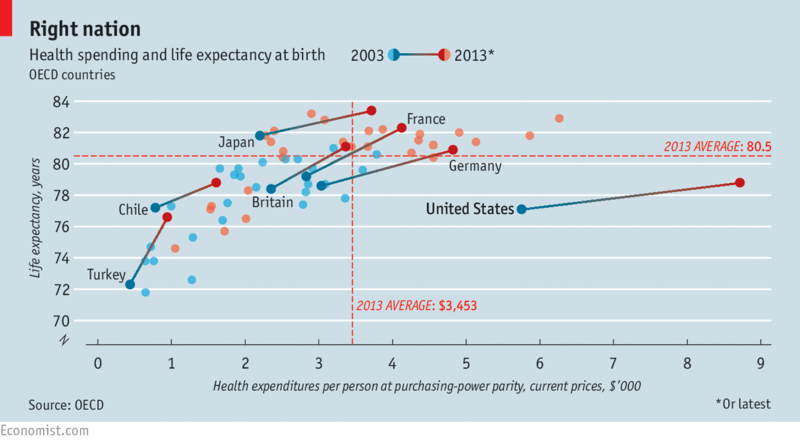 More health psending doesn’t nor necessarily pay off with better health outcomes, according to The Economist. AMERICA remains the world’s most profligate spender on health care, according to a report published on November 4th by the OECD, a club of 34 mostly rich countries. In 2013 America spent, on average, $8,713 per person—two and a half times as much as the OECD average. Yet the average American dies 1.7 years earlier than the average OECD citizen. This longevity gap has grown by a year since 2003. Americans have the same life expectancy as Chileans, even though Chile spends less than a fifth of what America spends on health care per person. From what I can find life expectancy looks to be similar to Britain as well, so the Britain bar looks about right for New Zealand. The US has a very expensive insurance based health system which inflates costs substantially but means that people who are fiancially poor are also likely to be health poor relatively. The chart shows that the level of spending does not necessarily equate to the level of care. National have offered voters of Northland many millions of taxpayer funded pork to try and rescue the electorate from a Peters and media onslaught. They have also piled probably unprecedented resources into the campaign itself, with a swarm of Ministers including the Prime Minister using a significant state funded travel advantage. National has poured massive, massive resources into Northland, most of which won’t show up in the financial returns. Polling, focus-grouping, canvassing, MP visits, Ministerial cars, taxpayer bribes, flying squads to drive people to the polls. All of it is off the by-election books. I have heard rumours that National’s total outlay is close to $250,000, not to mention the bill the taxpayer will carry. If National’s outlay is in the order of $250,000 then there are surely things that should come to the attention of the Electoral Commission? Lots of things aren’t caught by the rules. Venue hire, MPs’ time, ministers’ time, petrol, polling, focus groups, paying organisers’ wages, wood for billboards, wages for people to put them up. I can see how the costs could mount up very quickly. I might find it a little hard to get to $250,000, but even so, I can see how lots and lots and lots of money could be spent. The regulated period for the 2014 General Election will start on Friday 20 June 2014, and will end with the close of the day before election day (Friday 19 September 2014). An electorate candidate’s election expenses during the regulated period must not exceed $25,700 (including GST). It is a serious offence to spend more than this. If you are representing a registered party, you should stay in touch with your party secretary on advertising. This is because there can be boundary problems between advertising by candidates and advertising by the party, with consequential effects on the expenditure limits and expenditure returns of the candidate and the party. The election expense regime does not apply to people who are list candidates only. Any spending by those candidates promoting the party is an election expense of the party and must be authorised by the party secretary. This is for a general election but I presume it applies to a by-election as well. is promoted by the candidate or any person (including a registered promoter) authorised by the candidate. [See section 205 of the Electoral Act]. the apportioned costs for advertisements that promote two or more candidates, or a party and a candidate (see paragraph 6.5 below for further information on apportionment). [See section 3E of the Electoral Act]. A candidate’s deposit or the costs of food, hall hire, surveys or opinion polls, free labour, or replacing materials destroyed through no fault of the candidate are not election expenses. The cost of any framework that supports a hoarding (other than a commercial framework) is no longer an advertising expense. So National have a huge financial advantage in general. But it’s not all going their way. Winston Peters has had a huge and free amount of support from the media, getting effectively promotional that money can’t buy but can be priceless in a campaign. Such is the corruption of our electoral system. Money and media rules.